Later topic: Mystery inking (?) Issue! I want to apologize in advance as I do not know all of the technical names for each part and piece of the machine but I do feel like my thinking is on the right track. Please let me know your opinion on my issue. Thanks! Last night I came into the shop, a community shop with many different artist/printers, and was made aware of an issue that they have been having for some time. It has slowly gotten worse. The video below is to illustrate the noise. Before attempting repair, the grinding/clicking noise was constant. Before taking the video, I had not finished leveling the rollers. 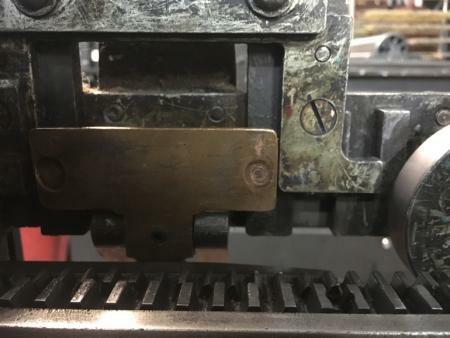 The first photo is of the wear on the brass plate that separates the gears on the form rollers when they have returned to the distribution roller. You will notice that the plate is pretty well worn, especially on the side furthest from the press bed. The second photo is to illustrate the difference between the two form rollers and how much stronger the one spring is. After noticing the difference in wear on the brass plate, I swapped the form rollers to see if that wear was what was causing the issue. It was not. Not solely anyhow. 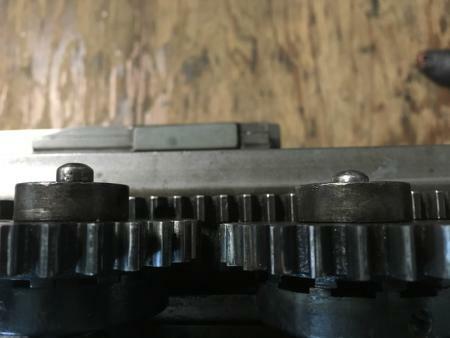 On the roller to the right (which before attempting repair, was on the left), depressing the spring is much easier and will not force the gear to separate completely. 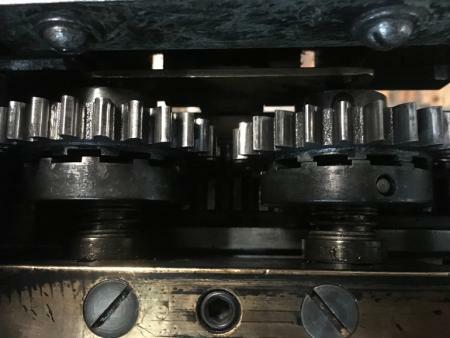 The third photo illustrates the obvious difference in separation of the gears on the form rollers. The left roller makes no noise and runs freely, the right roller is constantly catching as it barely has enough room for the two sides to pass by each other. The press is currently shut down for repair. I am thinking that all that is needed is to replace the spring and the brass plate. Any thoughts? Thanks in advance!